Citation: C N Trueman "1942 Siege of Sebastopol"
The Siege of Sebastopol took place in 1942, after the Russian failure to re-take Kharkov. The Germans had to take Sebastopol if they were to fulfill their aim in completing the southern arm of Operation Barbarossa – taking the oil fields of the Middle East. Sebastopol was a port in the Black Sea. As such, the city had a strategic value to the Germans in their drive south-east to the oil fields. 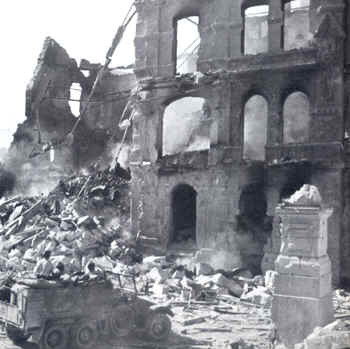 The successful taking of the city would also compensate for the failure of the Wehrmacht to take Moscow and Leningrad. The German XI Army was already engaged in fighting in the Crimea during the time of the Kharkov Offensive. Five German divisions were assigned the task of blockading Sebastopol from the land side and were supported in the air by VIII Fliegerkorps and Luftflotte IV. The Luftwaffe had a two-to-one advantage in this campaign. The push to Sebastopol started on May 8th,1942. Initially, the Germans were very successful. Russian defenders had little chance against 1,800 aerial sorties a day and the Russians had poor defences and fared badly on the ground. When the Russians lost the Kerch peninsula in the Crimea to the Germans in May 1942, it allowed the invaders to turn their full attention to Sebastopol. However, early success was to give way to rugged defending. The city was defended by the Soviet Coastal Army led by General I.E. Petrov. This force amounted to 106,000 men, 600 artillery guns, 100 mortars and 38 tanks. Petrov only had 55 serviceable planes at his disposal. The Germans had a formidable array of weaponry at their disposal, including super-heavy 615mm mortars. The 800mm ‘Dora’ mortar (carried by rail) was also brought up for the attack. For the attack on Sebastopol, the Germans could muster 204,000 men, 670 artillery guns, 720 mortars, 655 anti-tank guns, 450 tanks and 600 aircraft. In the Black Sea, the Germans stationed 19 MTB’s, 30 patrol boats and 8 anti-submarine boats. Surrounded at land and sea, getting supplies into Sebastopol would prove to be very difficult for the Russians. Plans were already afoot for submarines to bring in food and ammunition and a number of fast boats from the Black Sea Fleet were almost tasked for the same. However, whatever they brought in would never be enough. On June 2nd, the Germans started to bombard Sebastopol. This lasted for five days. On June 7th, German infantry started their attack. To start with, the Germans attacks were vigorously repulsed. But slowly, the impact of the blockade was felt by the defenders. Petrov only got one-third of what his forces needed on a day-to-day basis with regards to ammunition. The Germans later reported that the Russians had to fight hand-to-hand as they had no ammunition for their rifles etc. Russian machine gun fire was very sporadic – in an effort to preserve what ammunition there was. However, the Germans faced an almost fanatical enemy, willing to defend at all costs. The defenders of the ‘Maxim Gorky’ battery in Sebastopol is a classic example: of 1,000 men who defended the battery, only 50 were taken prisoner and all of them had been wounded. This alone represented an attrition rate of 95% for the Russians. By the end of June, the Russian defenders were in a critical position and on June 30th, the Germans fought their way into Sebastopol itself. An evacuation of the Russian forces in the city was ordered. It started on June 30th and lasted until July 3rd. The whole process of evacuation was gravely hindered by constant attacks by the Luftwaffe and by dug-in German artillery positions picking off targets at will. By the end of the siege, 90,000 Russian prisoners had been taken and the Russians had lost the equivalent of two armies. Russians who were not evacuated and had not been wounded, tried to get into the countryside of the Crimea to join up with the partisans. In recognition of what the defenders had achieved against almost impossible odds, the defenders of Sebastopol were awarded the ‘Defence of Sebastopol’ medal by the Presidium of the Supreme Soviet.